Create form 990 in Five Minutes or Less! How to Fill Out 990n? What Is A 990 N? 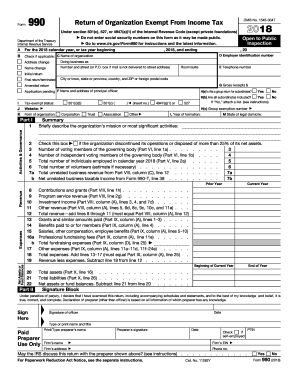 Form IRS-990, Return of Organization Exempt from Income Tax is one of the frequently used tax forms. Most nonprofit enterprises are required to file an income tax returns to IRS on annual basis. Such form provides IRS with details about organization`s activities for previous fiscal year and always has to be submitted on time. Information included in such form may be also disclosed to the public and provide it with financial details related to a nonprofit organization. Take a note that if an organization fails to submit a form during 3 fiscal years, the IRS has the right to revoke its tax-exempt status. There are several types of this form, so, in order to choose the needed one it is necessary to define the organization`s annual gross receipts first. Such form may be filed electronically or send by regular mail. We offer you to fill out an up-to-date blank IRS-990 form in pdf online and submit it to the recipient. In order to customize a document according to your requirements, download an editable sample and use the variety of editing tools provided. If required, a form can be easily shared with recipients online or printed. IRS-990 is divided into twelve parts. Start filling out a form with summarizing an organization`s mission or most significant activities. It is necessary to provide detailed information regarding organization`s expenses and revenue including all grants, benefits, investments, salaries paid out etc. Finish a document with reconciliation of net assets. Remember to fill in all mandatory fields in a document. After a form is completed, check if all data provided is true and correct. With the tax period coming both the individuals and businesses have to report their financial details to the IRS. Such information is used for calculating and withholding the correct amount of federal tax from their income. Here various IRS forms such as Form 990, Form 8880, Form 1120-A and Form 5304-SIMPLE may come in handy. You can easily complete any template in PDF just following our instructions. Fill out, sign and file editable samples online with no effort.